We really have been spoiled by the wonderful weather in the past few weeks. Although there was a sneaky little wind again today, I had decided to get myself over to Studland, and then on to Old Harry Rocks for the second weekend in a row, the big difference being that today I was going to cycle there and back. 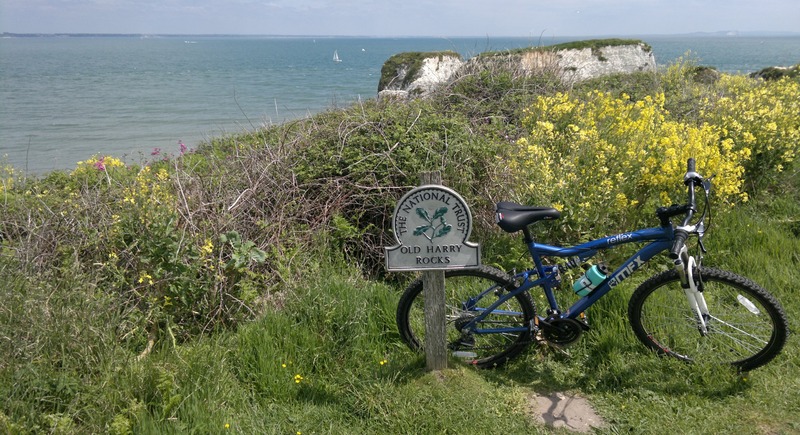 Now anyone who has been out and about in Dorset on two wheels, will know that the landscape is anything but flat as soon as you move away from the shoreline. Getting down to the ferry at Sandbanks wasn’t any trouble, although the wind was once again blowing into my face, making it a little more taxing than necessary. 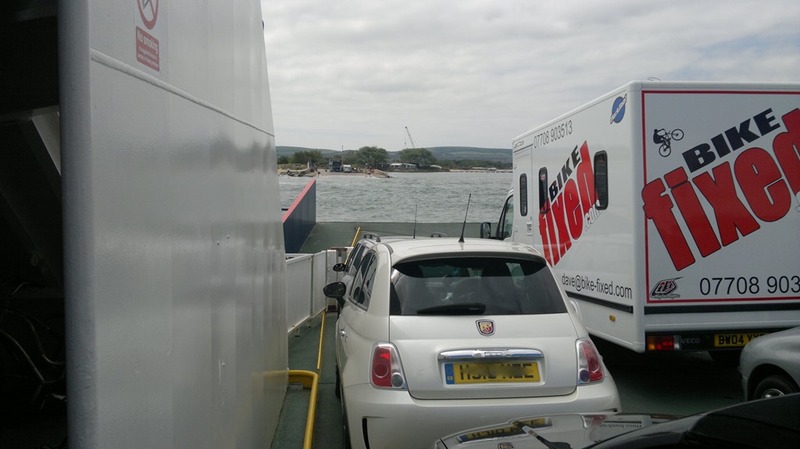 I arrived just as the cars from Studland were disembarking, so paying my £1, the fee for a return trip, I got aboard and stowed the bike. 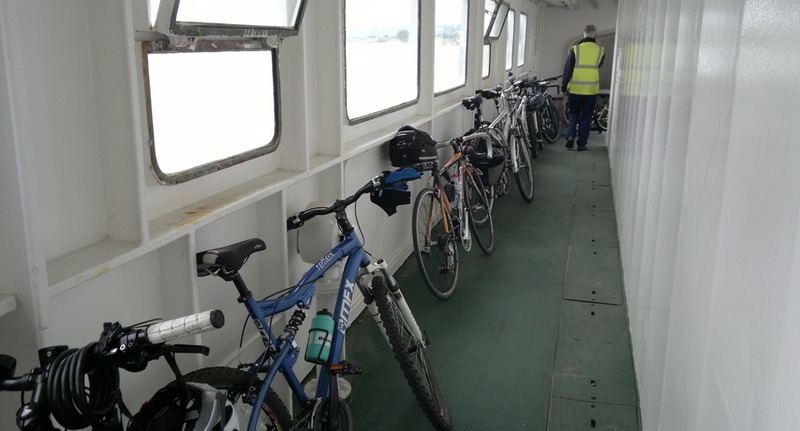 The crossing takes about 5 minutes, but it was clear from the others on board, that I wasn’t the only one who had decided to go cycling today. Not only that, but there was a cycling event going on, so there were lots of cycling related vans and cars as well as dozens of bikes sporting a rather distinctive numbers sticker from the event. Leaving the ferry at the far side was a bit of a scrum. The leisure cyclists got themselves fixed up with those competing in the cycling event and it lead to a degree of pandemonium. But having extricated myself from the throng, I set off along the aptly named Ferry Road. Initially the road is rather straight and flat, lulling the unwary into a sense of false security, it then starts to meander amongst the fields of heather and gorse and a nice downhill slope allows the rider to get up a head of speed. But don’t be fooled, in Dorset every downhill slope has an uphill climb on the other side. So with the speed washing off all too quickly I started up the painfully steep and leg sappingly long hill towards the Knoll House Hotel, and aptly named it is. The knoll from which the hotel gets its name is a bit of an understatement, let’s be honest, it’s a proper hill, but all the effort is well worth it. As you crest the summit you are treated to a stunning view of Old Harry off to the left, framed by the beautiful landscaping of the hotel golf course. An interesting contrast of manicured lawns and raw nature. After a couple more climbs, much more gentle in nature, I took the ecclesiastically named and quaintly narrow Rectory Road turning into Manor Road and on past the Bankes Arms. 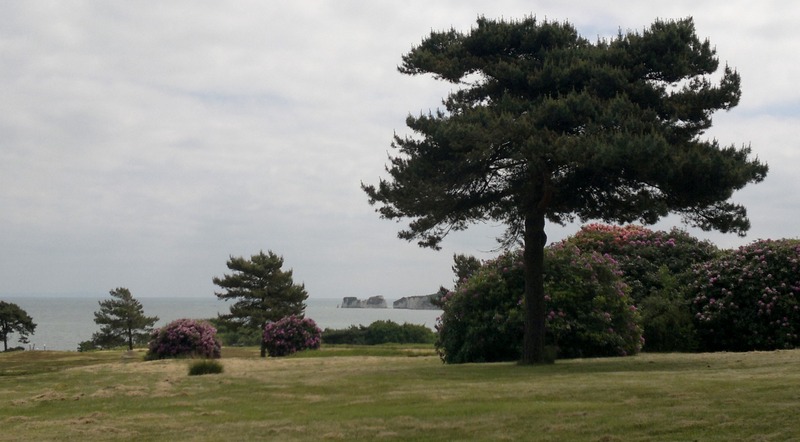 I have to admit that I walked the first part of the path past Harry Warren House, but as the incline reduced, it was lovely to ride up the South West Coast Path with views over the bay to Sandbanks and Christchurch. 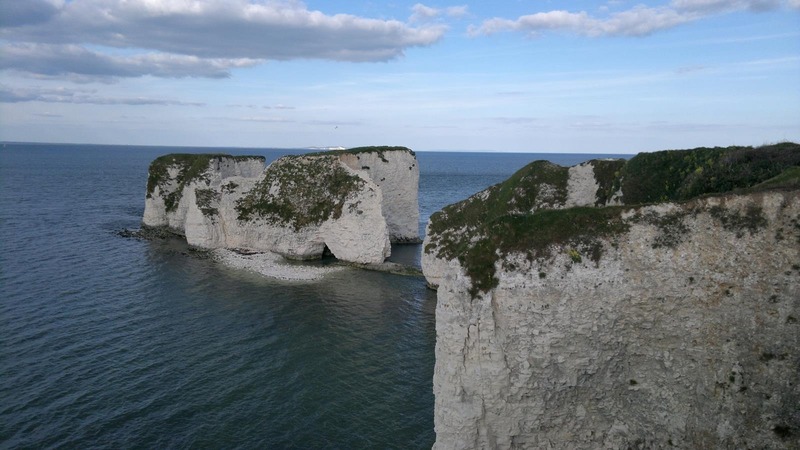 Old Harry Rocks are pretty amazing really. Comprising entirely of chalk, it is rather surprising that they exist at all. The very processes that have sculpted the stacks from the cliffs must be trying to dismantle them with each and every tide and storm. The resulting spectacle has been around for hundreds, maybe thousands of years, but in time it will be reduced to rubble, similar to that around the base of the stacks. Proof, if proof be needed, that everything, even geological marvels, are impermanent. Everything changes over time. I’ll not burden you with the details of the return journey, but with a total round trip of about 28 miles, much of which was either up or down, my legs may remember this little trip for a few days yet. 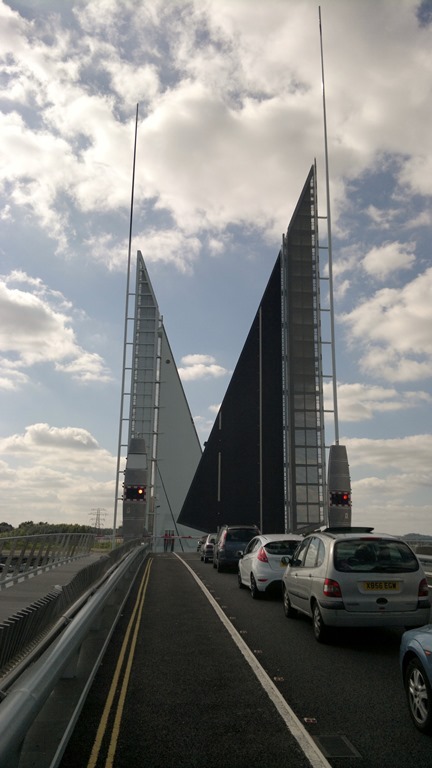 I have to admit that by the time I got back to Poole, I was quite looking forward to a nice hot shower and a sit down in a slightly more comfortable chair, so imagine my dismay when I found that The Twin Sails bridge was raised. Just another minor challenge, but I’m back home in one piece now. A bike ride is a bit like life in general. There are ups, there are downs. There are times when you feel that the challenges are just too tough to overcome, but with a little determination, you find a way. The rewards of overcoming these challenges are worth every ounce of the pain. Previous The Missing Link Next NOW … I Want It Now !! !